Pench National Park: In Mowgli's Seeonee, Tigers burn bright & Treehouses enchant ~ The Wandering Soul's Wander Tales.. It was an unusual moment for many of us but it was in fact common for the queen to be this generous. 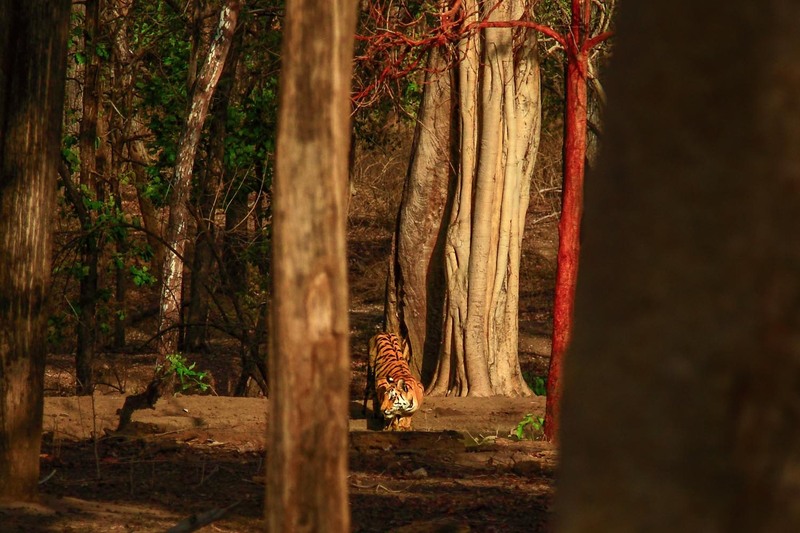 Not one, not two but three gorgeous Royal Bengal Tigers were ambling through the sun-dappled forests of Madhya Pradesh that morning, completely oblivious to the rarity of such a precious sight. Led by the legendary Collarwali, the undisputed queen of Pench, a tigress that has now gained cult status among wildlife enthusiasts for her record-setting offspring count, proficiency in seeing cubs through to adulthood and her audacious appearances with her litter, I gaped in complete disbelief as the shy cubs timidly followed their mother. It was the summer of 2016 and Kipling’s Jungle Book had just gotten one of its most illustrious silver screen adaptations yet. Images of Mowgli running through the jungles of Seoni flashed in my mind as we drove through the parched landscape of Pench National Park, which is part of the larger landscape where the story was originally set. As a casual wildlife enthusiast whose precious wildlife sightings have always been more dependent on incidental luck rather than devoted planning, I wasn’t expecting to win the lottery. But it was only fair that I call the sightings of that summer in Seoni, a jackpot by any standard. I was ecstatic already thanks to the previous moonlit night when I slept to the view of a single firefly glowing against the glass walls of my room in a treehouse. It was sheltered under the branches of a towering solitary Mahua tree set in a field of open grasslands. But the next afternoon was to bring more joy, of the incidental kind. Lazily meandering from the completely uncrowded Karmajhiri forest gate, we arrived at Alikatta fire line where a bunch of jackals were devouring a recent kill. Sensing something in the air, the jackals scurried quickly leaving us in a tizzy of eager anticipation balanced with tempered expectations. Riding a green Hero Splendor with the words Forest Patrol emblazoned on to its side, a forest officer with a towel wrapped around his head, stopped by the side of our safari vehicle and confirmed the movement of a tiger in the vicinity. The marks of an unfortunate encounter with a tiger clearly visible on his right hand, Mr. Patel seemed a cheerful person with a treasure trove of wicked stories. I always wonder what gives these men the strength to work in such an unpredictable and wild territory. Many do it for a living and very few do it for the thrills perhaps, but there’s no denying that there are more dangers than there are thrills in this line of work (Read: Living with the Tiger). As expected, he was the first one to notice yellow stripes in the bushes to our left. Camouflaged deftly in the brown grass till then, a tiger soon emerged into the open space between the tall trees. In a sequence of stunning beauty, the 14 month old female cub identified as one of Collarwali’s litter, sauntered through the gap in the trunk of a sprawling banyan tree to settle in the murky waters of a small pool next to the striking red bark of a drying Amaltas tree. For more than 20 twenty minutes we were privy to this spectacle during which time the initial frenzy of incessant clicking gradually transitioned into pure joy of simply observing a magnificent creature. In the meantime I was apprised of Collarwali’s legendary status. Originally monikered as Mata ram, which I felt was more reverential than the unoriginal Collarwali, this tigress was part of the family that gained much popularity in BBC’s path breaking documentary called "Tiger: Spy of the Jungle". Using elephants carrying logs and trunks fitted with camouflaged cameras for over two years (Read: Trunk-cam reveals jungle secrets), unseen footage of life of a tigress and growth of her three tiger cubs was captured for the first time ever from close quarters, catapulting both Pench and the family to worldwide recognition. Collarwali’s mother, Badi Mata was known as queen of Pench for her indomitable spirit and the fact that she birthed 19 tigers in her lifespan. Collarwali later took on that mantle and upended Badi Mata's feat by successfully giving birth to a record-setting 22 cubs so far, singlehandedly helping the tiger numbers rise in Pench Tiger Reserve. She was radio collared at first to track her movements but the collar is now defunct. But the collar seems to have stayed on as an unofficial crown to the reigning queen of Pench. It was only then that I pieced together the draw these famous tigers have and the part they play in bringing big money and recognition to national parks. Countless visitors arrive in droves to witness the tigers they’ve come to admire through these documentaries. The opinion is divided on glamorising particular tigers but the allure of knowing a tiger by name and following its story like you would of your favorite star is intangible. It is this exact anthropomorphism that has become the bone of contention between biologists, conservationists and casual enthusiasts. I am not sure how I feel about that but I sure was eager to get a glimpse of Collarwali after having known her fabled tenacity. As if on cue, she made an appearance and crossed the mud track with a regal air, the collar firmly held in place around her neck. She walked over to the wandering cub on the other side and towed her back to their safe territory. Turns out the jackals we saw earlier had indeed been eating into the tigress’s stash. Aren’t neat endings incredibly satisfying? I loved how this whole story came together in the end. Kipling's Shere Khan gets all the bad rep but he was only trying to protect the forest and himself from humans. More than a century later, the rock star tigers of these jungles are still fighting the same battle. However, if you don't arrive at Pench with prior knowledge of Jungle Book, there's little that'll remind you of Kipling's fictional world. But the tigers that roam these forests are busy leaving behind a rich legacy, more than Mowgli ever could in Seoni. Clockwise L-R: Deer grazing in the grasslands of Pench; Sunset in the hinterlands of Seoni; Do you see three tigers in the picture? The next morning I woke up with a smile plastered on my face and without the burden of expectations. But once inside the jungle, three tigers leisurely walked past our safari vehicle in the glint of the morning sun. It seems my lucky stars decided it was my turn to be offered gifts I did not even dare ask. Or was it the queen’s magnanimity all along? Pugdundee has mastered the art of effortlessly combining luxury with wilderness, but seems they have outdone themselves here at Pench. Six treehouses are spread far apart around a central dining & common area in a large forested area at the edge of Pench National Park. Each treehouse , tastefully decorated in earthy tones, offers uninhibited view of the grasslands below and the starry skies above, from the comforts of a luxurious hideaway perched 18 feet above the ground, nestled in the branches of individual Mahua trees. Clockwise from top: Twin beds inside the treehouse suite; A view of the sit out deck and the French windows; Mahua tree branches as seen from the deck; Comfortable lounge corner inside the treehouse. Featuring large glass doors and windows, wilderness is practically only a wall apart, which is the best feature of the tree house according to me. Next best thing is the spacious sit out deck from where bird watching was an absolute pleasure, emulating the treetop views Mowgli perhaps had. I remember spending a lot of time watching golden orioles flitting about, drongos chasing crows around and Indian roller flashing it’s many colors. Apart from the many birds, I also spotted a resident jungle cat and wild boars from the deck. In theory it is a luxury suite, but it would be prudent to think of the treehouse as an extremely well appointed tent set in the heart of wilderness in terms of precautions – which means no food in the treehouse as it could invite unwanted attention, keeping the doors closed at all times, being prepared to deal with bugs and no wandering alone after dark. The atmosphere is kept as natural as possible, so you won’t find bright lights lining the trails leading to the treehouses or a crowd if you’re looking to swap daily updates with fellow travellers. True to its form, the treehouse even sways when the winds pick up and you might even find a Civet Cat waiting for you at the doorsteps as it happened to Mridula, my roommate during the stay. It can get scary if you’re alone and not used to jungle sounds or silence for that matter. If not, this is a perfect place for a digital detox considering there's no one else around and no network that reaches here. Situated in the underdeveloped zone of Karmajhiri, Pench Tree Lodge is the only property in the vicinity amidst a small scattering of mud houses spread apart in the far distance. Out of the three forest gates that provide access and safari vehicles into Pench, Turia is the most common gate where whopping 68 vehicles per day are allowed. Compare that to the 6 vehicles per day allowed from Karmajhiri gate, which is at a distance of 6 kms from the Pench Tree Lodge, and you’ll see how exclusive this property is. For more information and reservations, head over to Pench Tree Lodge's website. A report from 1960 - Kipling's Jungle: Fact or Fancy? Note: My trip to Pench was sponsored by Pugdundee Safaris. I had been to Pench three years back and all I could manage was a tiger paw :D I hope some day, I am able to spot wild in their home, instead of terrible outside locations such as a zoo! Loved the write up Neelima! Loved the write up. Felt as if I was right there in the jungle.